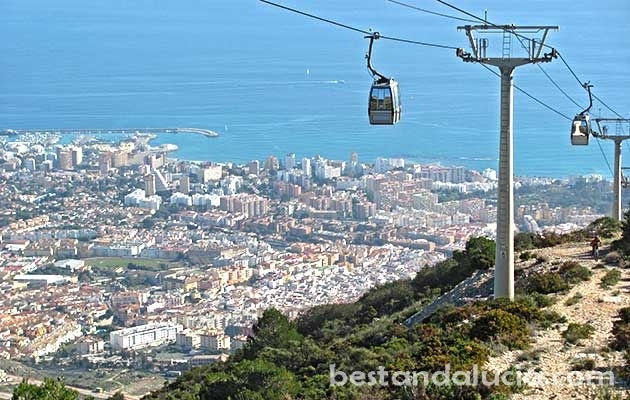 If you want to enjoy the best panoramic views of Costa del Sol, the Cable Car in Benalmadena is something you cannot miss. The 15-minute 3-km long cable car ride will take you the summit of Mount Calamorro, around 800 above sea level. Once you are on the top, you will see several paths with rocky steps and handrails built around the top of the mountain. That’s how you will be able to access several viewing points with sensational panoramic views in all directions of Costa del Sol. Try to plan your ride on a clear, as you will be able to see much more in this way. You will even be able to see Gibraltar, Morocoo or the snowy range of Sierra Nevada! Twice a day, usually around 1 p.m and 8 p.m., there is a birds of prey show on the top. Make sure you plan your visit around those times as the show is very interesting. You can get close to birds and you will also be able to hold one of the eagles and then get your photo taken. There is a small restaaourant and gifts shop on top of the mountain as well. If you are mountain biker, you will be able to take your bike to the top and go downhill. To get the best value from your money, we recommend to buy a full Selwo ticket that includes all the three Selwo attractions: Teleferico Benalmadena, Selwo Marina in Benalmadena and Selwo Aventura near Estepona. The full Selwo Ticket is cheapest off season. In winter the full Selwo ticket for an adult costs as little as 30 Euros (as of 2014/15 season)! Another way to save up some money, is to get a 10% discount card from the tourist information centre in Benalmadena.